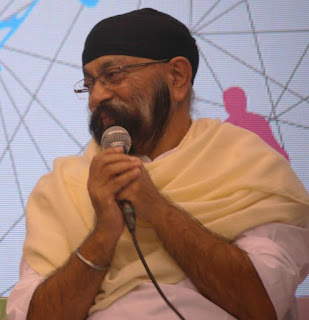 In the open forum, organized by the 14th Pune International Film Festival committee, on the first day of the festival, the music composer Uttam Singh, who was felicitated on the opening day of the festival with S D Burman international award for creative sound and music, interacted with festival delegates. The meet was steered by Dr Jabbar Patel, the Chairman of the PIFF, in an interesting way. Uttam Singh [Music Director: Dil to Pagal Hai (1997), Dushman (1998), Gadar: Ek Prem Katha (2001)] was born in 1948 to a musical family in Lucknow. His father was a devoted sitar player, although he took a vow never to 'sell' his music to worldly patrons and the public. Singh shared with the audience how his father left home, after a sustained pressure from his grandfather to give up music for more worldly pursuits. Uttam Singh accompanied him, as a kid. They survived on Gurdwara langarkhana, and would sing for the highest audience, the Almighty, in gratitude. They travelled across India for eight years, to finally set foot in Bombay, on the first day of 1960. Just 12, Singh began learning Western classical violin from the famous music composer and arranger Anthony Gonsalves (tributed in the eponymous song in Amar Akbar Anthony (1977) enacted by Amitabh Bachchan in the character of the same name). His first solo performance, and first break, came from the music director Naushad, around 1965. Those days he was also influenced by the music director Mohammed Shafi. His association with Shafi would go on till Maine Pyar Kiya (1989), in which Singh would arrange the music. Throughout his reminiscence SIngh kept on comparing the current popular music scenario with the period between 1960 - 1990s. Those days, every composer was original. The concept of cover, let alone copies, was unimaginable. Yet, the giants like Madan Mohan, Naushad, Shankar-Jaikishan, Roshan were always exchanging ideas freely. There was no fear of stealth. Each of them had different style, independent of the others, and the characteristic signature. Uttam Singh deplored that such individual mark is non-existent in today's digital production, when it is far easier to create and record music. A long share of Uttam Singh's discussion involved man-management, collaboration and passion. Despite the existence of branding, the singers of yesteryears, the stalwarts such as Kishore Kumar, Lata Mangeshkar or Mohammed Rafi, had to accept the fact that they had to sing in the Music Director's gayaki (i.e., consistently signatorial style). Singh offered an example. In some film, Mohammed Rafi was singing under the music director Shri Ramchandra. However Rafi Saab's gayaki was following Shankar-Jaikishan's signature murki (rapid succession of collective notes). Shri Ramchandra stopped Rafi and flatly told him that the latter was not singing his tunes. Rafi had to change accordingly. Today, irrespective of the music director, singers sing everything in the similar way. Maybe the composers, the music directors themselves, have lost independent ways of looking at the world, and the music, Singh remarked. A song violinist himself, Uttam Singh had a lot to talk about the role of the song violin as aid to the leading singers of his days. The violin used to substitute for the voice in places. It used to keep the singer in the track too. However, compared to the structured system of music writing and arrangement in the European operatic or symphony orchestra, the Indian film music has been prone to highly subjective interpretations. Unlike their European counterparts, the Indian musicians do not know, unless specifically told, how to play their roles in the big machinery of an Indian orchestra. Singh had, however, to praise the Indian singers. He said, the biggest stalwarts, such as Kishore Kumar, returned more than thousand percent of the guidance they received from the Music Director's composition. He remembered several occasions where Kishore Kumar's voice sworded through and outnumbered in sheer volume, the whole orchestra. The voice had to be levelled down, and orchestra levelled up significantly, in the mix, on such occasions. This individual performance, staying well within the composer's stylistic gayaki, is known as nayaki in the context of Indian marg sangeet. Today's singers mostly lack such nayaki, Singh opined. Dr Jabbar Patel, whose use of music in his own films such as Samna (1975), Musafir (1986) or Mukta (1994), was in dialectic relationship with the visual narration in the films, was inciting Singh from time to time, to bring the memories of those days back on stage. Patel said, there used to be a single microphone in the recording room for all the musicians, sometimes in the biggest studios. Famous studio had only four microphones. They had to be shared among all the musicians. So, the full orchestra was played several times, each time for a single musician, especially the leads, such as the song violinist, who were recorded separately. Four track recording was a novelty even in the 70s. Any gap, or shortcoming, in the recording meant the whole piece had to be entirely rerecorded. That called for a strict sincerity on the musician's part. Nobody could skip this routine, irrespective to his/her fame. They had a 2--hour busy day, throughout the week, on an average. Music, and music arrangement, Was their life. Uttam Singh comes from the Ilyaraja camp. He has arranged for Raja, starting from the Shiva (1989) days. When Dr Jabbar Patel pushed Singh, with the desire to know the latter's opinion how A R Rahman made the accompanying sound track more important than song, Singh evaded an answer. He praised Dolby and the subsequent changes to sound recording and reproduction, however. With his sustained grief over the fragmented, individualistic, music industry without individual signature of anyone's own, Uttam Singh seemed to stay back in the golden days of Bollywood studios and a parallel new wave. The contemporary spree of activities, and the loss of continued honing of skills and military regimentation in the recording routine, confuse and irate him, it looks. He echoed the preference for a fixed role for everyone, with progressive learning curve. For example, he said, O P Nayyar refused to take an award named after a singer. Nayyar said any such award, given to a Music Director, must be in the name of any Composer, musician, or lyricist. For him, as well as for Singh, the lyricist was God. Singh was all praise for Anand Bakshi. He cited several anecdotes about how quickly Bakshi could pen down a song after he was given the tune and tempo. Half of the time, Uttam Singh remarked, it was Bakshi's, or other lyricist's, works that led Uttam Singh to begin with tune, in turn. 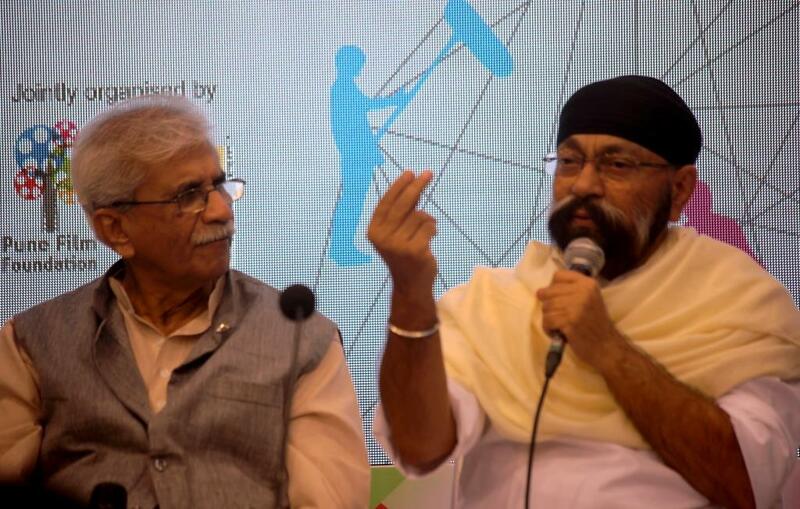 Asked why singers occupy such prominence stardom in our country, Uttam Singh said that it is the singer who makes the songs immortal. Abroad they are called vocal instruments. Here, in India, they are the souls of songs. Other instruments provide only a background to their rendition. In Uttam Singh's childhood the Bollywood music scenario was largely defined by the Bengali, and at times Carnatic, music influence. That changed with the film Khajanchi, the first Bollywood film with a prominent Punjabi theka that brought more power to Bollywood songs, snatching them from the mellifluous Bengali softness. When Dr Patel asked Singh about the loudness and overuse of Sufi songs in contemporary Bollywood, Uttam Singh denied this was Sufi at all. He said this was branded Sufi - the commercialization of a few aspects of the tradition, including its use of extreme soprano - the taara saptak. Singh expressed his concern about the commercialization of today's music. He said music became homogeneous, without any individual character among renditions by different artists, or composers. Singh's dad advised him not to play for others. He said, "Sing or play for yourself, for Him." Sufiana songs should never shout. They are about the internal journey - the deep meditative state and the preceding journey. Today's sufi branded songs are too loud. That shows such songs are something else in the name of Sufiana, Uttam Singh remarked. Quite a few questions were thrown by the audience, to Singh. One was about how he composed the four different parts of the same theme song from Gadar: Ek Prem Katha (2001). Uttam Singh revealed that he was not sure how four different scenes in the narration would connect by the same song in the overall structure of the film, beginning from the initial love, to separation, to the hero's journey to Pakistan to claim his family back. Like an inspiration, it all came to him - the basic tune - after a morning's warm up. He took that tune immediately to Anand Bakshi, who took only a day to compose words set to the tune. Uttam Singh, like many others of our times, expressed a concern over the decline of a structured music education from childhood. Unlike Europe, Indian kids do not go through music lessons in school. That must be changed, he remarked.